Shelburne, VT - February 6, 2014 - Meach Cove Farms and groSolar have announced the completion of Limerick Rd Solar, LLC, a 2.96 MWdc solar photovoltaic (PV) system in Shelburne, Vermont. Project design and solar engineering was performed under the direction of L.W. Seddon, LLC and the installation and construction was managed by groSolar. 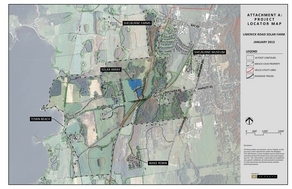 The project is located on 15 acres of the 1,000-acre Meach Cove Farms, a certified organic farm focusing on efficiently using local natural resources. "The Limerick Rd Solar project enhances the mission of Meach Cove Farms and will provide many benefits to our surrounding community. As an organization we conduct research on projects which provide renewable energy alternatives to fossil fuels. This solar project represents an important step forward in reducing our dependence on fossil fuels and creating clean, renewable energy for the community," said Christopher W. Davis, manager of Meach Cove Farms. Average annual electrical production from the facility is estimated to be 3,450,000 kilowatt hours (kWh), which is equivalent to the annual electrical consumption of 385 average Vermont homes. The electricity produced will be sold to Vermont utilities under the state’s Sustainably Priced Energy and Economic Development (SPEED) program. The solar facility uses 9,878 Renesola 300-watt photovoltaic modules mounted on a Schletter racking system. DC power is converted into utility-grade AC power by five Advanced Energy inverters located in two PowerStation enclosures. "Working with groSolar and Meach Cove Farms on this project has been a very successful collaboration. All three of our organizations are dedicated to designing and constructing renewable energy solutions that utilize local resources in the most environmentally responsible and cost-effective way," stated Leigh Seddon, of L.W. Seddon, LLC. 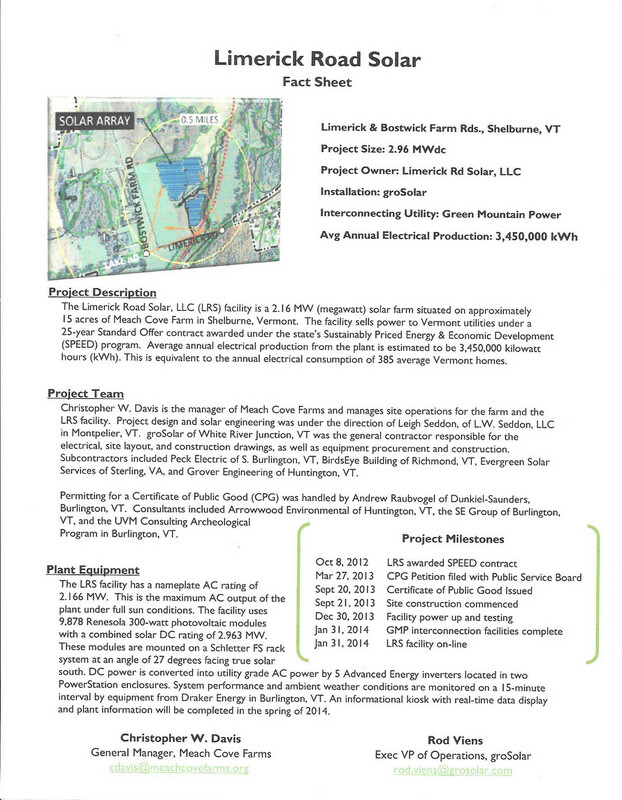 "This project was completed on schedule and within budget due to the excellent project management and collaboration between groSolar and Meach Cove Farms."